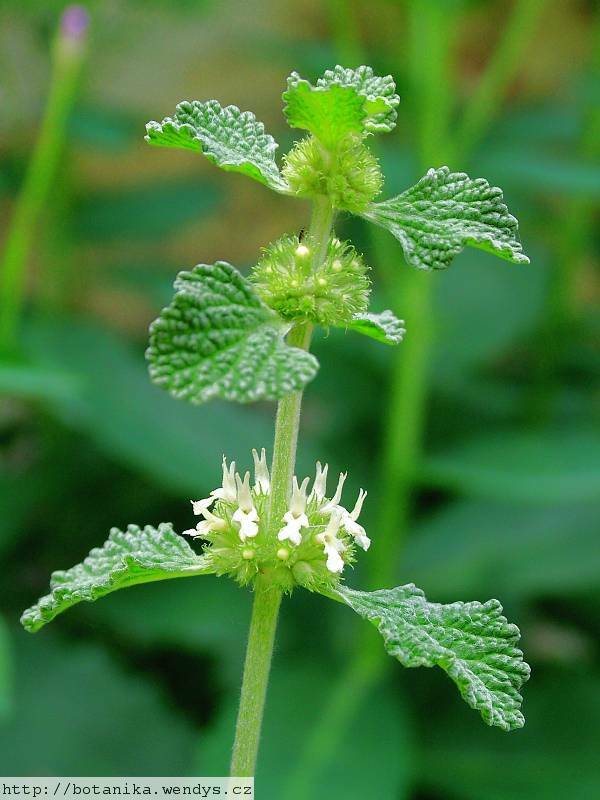 White horehound is a well-known and popular herbal medicine that is often used as a domestic remedy for coughs, colds, wheeziness etc. The herb apparently causes the secretion of a more fluid mucous, readily cleared by coughing. The leaves and young flowering stems are antiseptic, antispasmodic, cholagogue, diaphoretic, digestive, diuretic, emmenagogue, strongly expectorant, hepatic, stimulant and tonic. 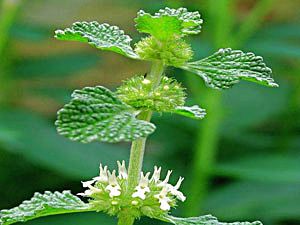 Horehound is a very valuable pectoral, expectorant and tonic that can be safely used by children as well as adults. It is often made into a syrup or candy in order to disguise its very bitter flavour, though it can also be taken as a tea. As a bitter tonic, it increases the appetite and supports the function of the stomach. It can also act to normalize heart rhythm. The plant is harvested as it comes into flower and can be used fresh or dried. The root is a remedy for the bite of rattlesnakes, it is used in equal portions with Plantago lanceolata or P. major. Downs, waste places and roadsides southwards from central Scotland, though perhaps only native near the south coast of England. The leaves are used as a seasoning. Bitter and pungent, they are sometimes used to flavour herb beer or liqueurs. Horehound ale is a fairly well-known drink made from the leaves. A mild pleasantly flavoured tea is made from the fresh or dried leaves, it is a favourite cough remedy. An essential oil is obtained from the plant and used as a flavouring in liqueurs. The plant has been used as a cure for cankerworm in trees. No more details are given but it is probably a strong infusion of the flowering shoots, or the essential oil, that is used. The growing plant repels flies. Seed - sow April/May or August/September in a cold frame. Germination can be slow and erratic. Prick out the seedlings into individual pots when they are large enough to handle and plant them out in the following spring. Basal cuttings in late spring. Harvest the shoots with plenty of underground stem when they are about 8 - 10cm above the ground. Pot them up into individual pots and keep them in light shade in a cold frame or greenhouse until they are rooting well. Plant them out in the summer. Division in spring. Larger clumps can be replanted direct into their permanent positions, though it is best to pot up smaller clumps and grow them on in a cold frame until they are rooting well. Plant them out in the spring.